In her college and graduate school days, Laura studied multiple times in Japan, focusing on Edo period (1603-1868) art and Japanese woodblock prints. In 2009, she founded New York-based My Curator, a company specializing in Edo period art consulting. Three years later, she received a doctorate degree in art history from the University of Wisconsin with a dissertation entitled, The Utagawa School: Continuity, Competition, and Collaboration in Edo Print Culture. 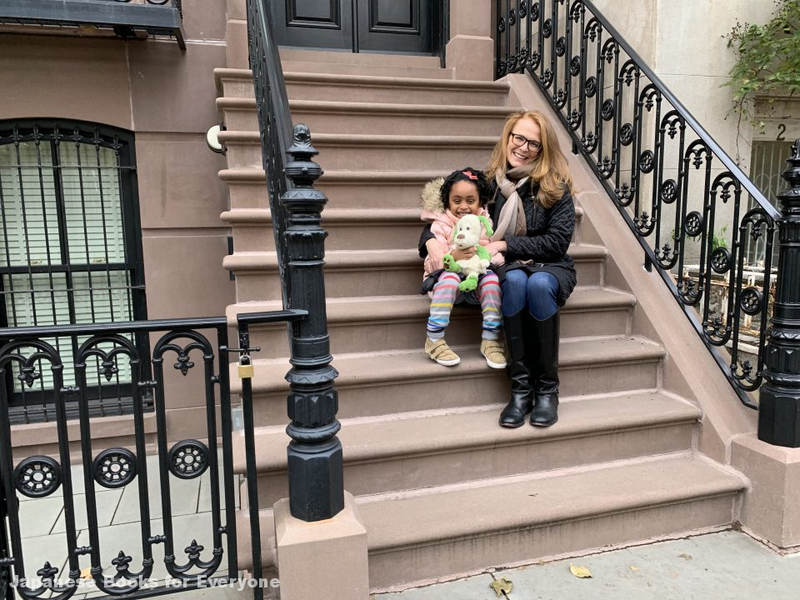 This year, Laura will move to the Pacific Northwest, where she will be taking on the curator of Japanese art position at the Portland Japanese Garden. Laura is also the author of notable works Adornment in Clay: Ceramic Netsuke from the Richard R. Silverman Collection (2010), Strong Women Beautiful Men: Japanese Portrait Prints from Toledo Museum of Art (2005), and Competition and Collaboration: Japanese Prints of the Utagawa School (2007). 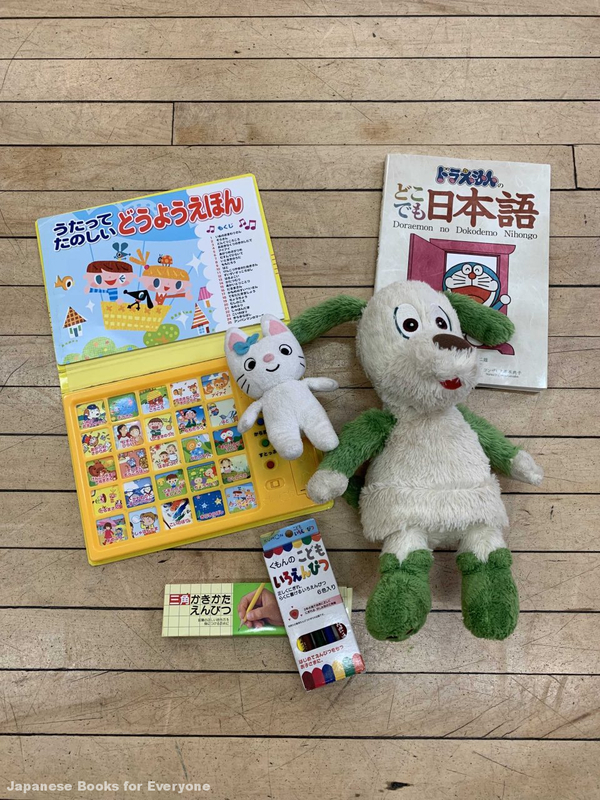 Because her daughter is interested in the lovable robot-cat Doraemon, Laura picked up a copy of Doraemon’s Anywhere Japanese from New York’s Kinokuniya bookstore. 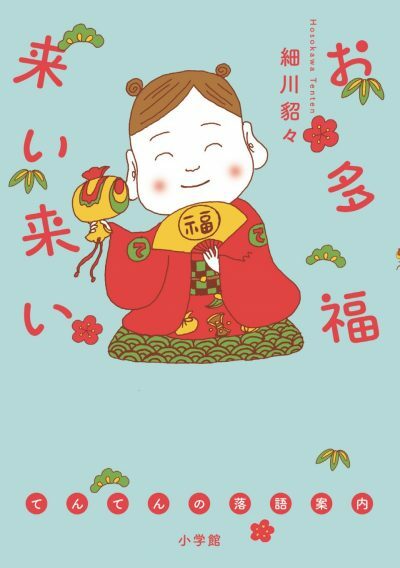 “The book follows the typical lifestyle in Japan and the usage of the language is really interesting. 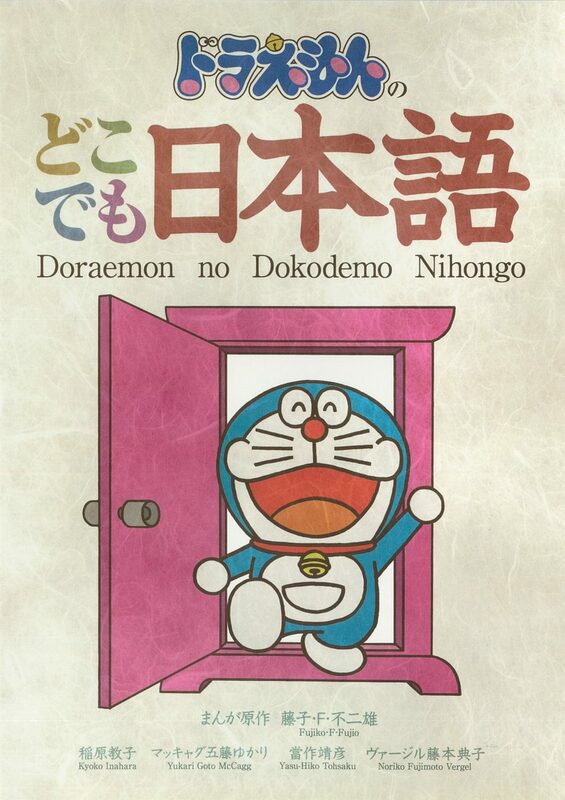 Plus, it features Doraemon manga, so it’s easy to understand! 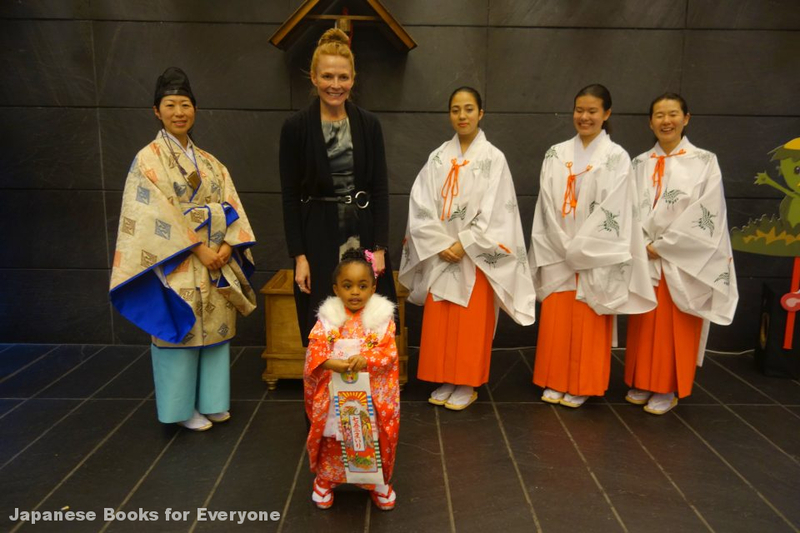 The dialogues are a little advanced for a six-year-old language learner, but I think she’ll definitely grow into them as she grows older.” The photograph below shows Laura and Ama-chan with Shinto attendants at the New York Japan Society's Shichi-Go-San, a festival celebrating children aged three, five, and seven. I think using manga to learn Japanese is a great way to keep language learning fun, and to keep children engaged and motivated. 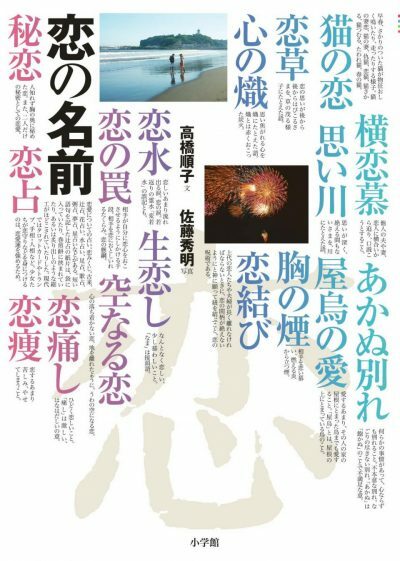 For someone like me who has studied abroad several times and has lived in cities like Kyoto and Kanazawa, the lifestyle, customs, and annual festivals of Japan depicted in manga feels real and nostalgic. 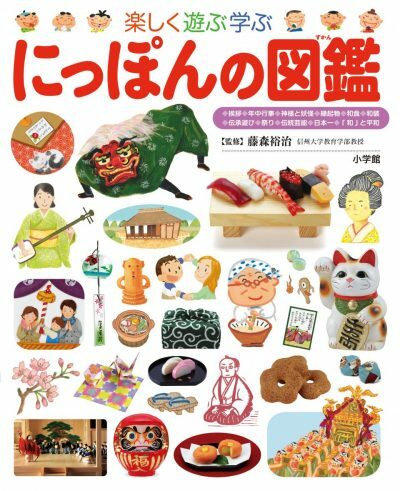 This book brought back memories of my first time living in Japan, the things I discovered, and the surprises and cultural connections I experienced. Reported by Junko Takaku. Edited by Yu Fujita. Translated by Devon Menuez.